Beehive Blogger Template is a unique personal free blogger template, focused on minimalism, elegance and lots of features. This design features Multi Author Posts, Unique Slider at the top, Smart Sticky Menu which automatically hides itself while you scroll down and shows itself when you scroll up. The Beehive can give you ability to post your thoughts on your blog in a great way, leaving your visitors and buyers impressed with the awesomeness of your website! 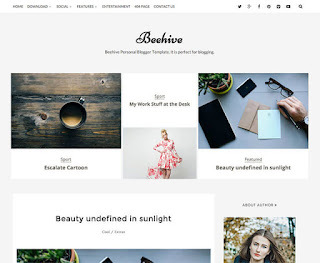 The Beehive Personal Responsive Blogger Template has a design for personal blogging websites that focuses on their content for their esteemed users. This responsive blogger template features an awesome Author image fetched directly from Google Plus account to show on homepage. It also has the slider of post images on homepage if there are 2 or more images in a single post. Beehive responsive blogger template has responsive Sidebar which automatically changes to a full width element on smaller screen devices. This personal template is very user friendly to setup via our Documentation attached and it attracts every visitor.